37 Wells has been lovingly brought into the 21st century and compares very favorably to homes of any era. Fireplaces, wide-plank flooring, exposed posts and beams, and other historical details are skillfully incorporated into a comfortable and modern home. The kitchen is a bright space that would fit right in on HGTV with stone counters, stainless appliances, apron sink, and island. The adjacent great room has a wood stove and space for both dining and seating areas. A living room, den (possible 4th bedroom), and an updated full bathroom complete the main level. Upstairs includes an open landing that makes a quiet sitting area, a master with walk-in closet, two additional bedrooms, and a full bathroom. Windows and doors have been replaced, and heat is provided by an efficient Buderus boiler with multiple zones. A propane generator ensures that the home remains bright and warm no matter the weather. On sunny days you’ll be drawn outside to the beautiful 1.9 acre property. Outside the kitchen is a brick patio in a fully fenced portion of the yard, with raised garden beds. Another part of the level grounds includes a variety of fruit trees. The large barn is divided into different sections. Closest to the house is a secured and heated workshop area with a rebuilt loft. Parking for two cars makes up the next section, followed by more traditional barn space that was formerly allocated to chickens. Don’t miss this amazing property – you will instantly know that you are home! 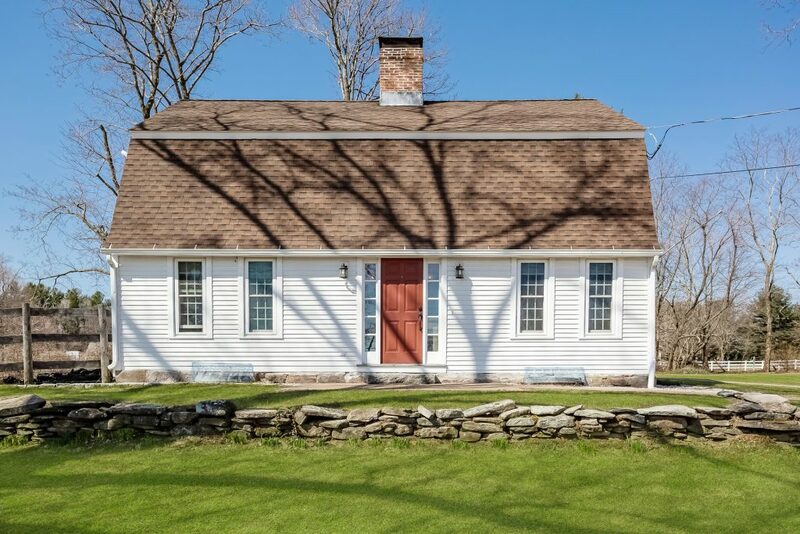 37 Wells Road is offered at $350,000. If you’d like to see this home, please have your agent arrange a showing or call Amy at 860-655-2125 to schedule a visit. More details are available. It’s been a few months since we published an update on contract activity, and the local markets were rather active over that time. 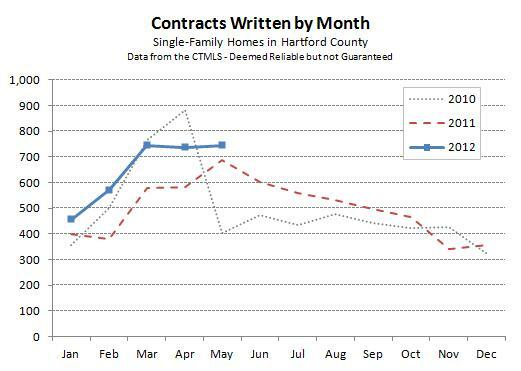 Hartford County finished September with 739 single-family contracts, an increase of about 17% over September of 2014. It was the fourth month in a row of strong outperformance. On a year-to-date basis the County is about 800 deals and 13% ahead of where it was at this point of last year. Year-over-year outperformance is spread across most of the price bands, with only $1+ million homes showing a decrease in deal count in 2015. However the lower price points, where the vast majority of the County’s deal take place, are the most impressive. The lower price points are also the most favorable to sellers, with the fewest available listings. Inventory levels rise with asking prices. There is only about 2.3 months of inventory for single-family homes with asking prices of less than $100,000. The metric jumps to 4.4 months for the $100,000s; 6.2 months for the $200,000s; 7.5 months for the $300,000s; and 8.3 months for the $400,000s. Above $500,000 inventory is consistently above 10 months, and it continues to rise with the price point. 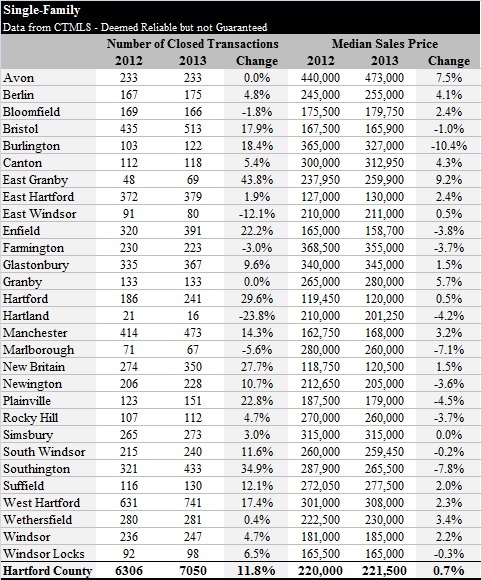 2015 has not been equally good to all the towns in Hartford County. There are two towns in which the year-to-date contract totals are actually down from 2014. Many of the larger towns are showing single digit growth. At the other end of the spectrum, Granby has 54% more activity this year than last year. Its activity increase of +51 contracts puts it in direct competition for biggest jump in deals with much larger County towns. Go Granby! 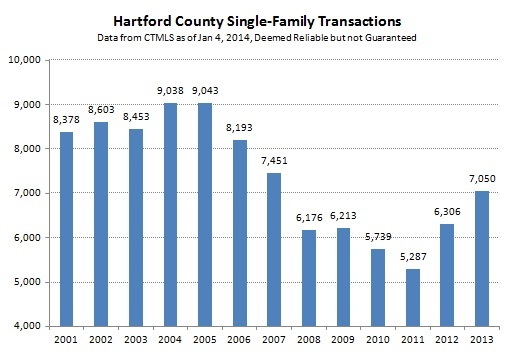 Last week we published some charts showing the direction of the overall single-family market in Hartford County for 2013. The quick summary was that sales activity has been increasing nicely for two years, but median prices have been stuck in a protracted valley. The data tells a variety of different stories when we zoom in to the individual towns. Before we get there though, a quick disclaimer. It’s difficult to take too strong a position about any single data point without looking more deeply into what is happening in the town. We’re going from 7,000+ data points on the year at the County level down to a small percentage of that number for most towns. With that, here is the table showing each town. East Granby saw the deal count increase 44% and the median sales price rise by 9%. The towns with the 2nd through 8th largest increases in deal count had median prices either remain virtually unchanged or decrease. Avon and Granby both exactly matched 2012 in terms of deal count, and both saw the median price rises. Simsbury remained basically unchanged in each metric. 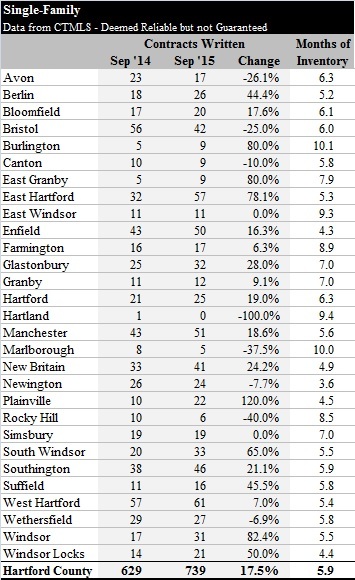 Only five towns had their number of successful closings decrease in 2013. Hartland, Marlborough and Farmington were the only three towns with negative deal count growth and negative median price change. The markets in each town have their own story to tell. In order to understand what’s happening, the mix of homes that sold, and the level of distress in the market, must both be considered. One could imagine that the multiple towns with large increases in deal count but falling median prices were highly impacted by distressed sales. We have a model that lets us more easily visualize the numbers for each town, organizing the raw sales data into various charts and tables. I doubt we’ll post the charts, there are far too many, so please feel free to reach out to us if you have specific questions about what is going on in a particular town. We are happy to share. Most of the year we avoid looking at prices when we analyze market statistics. Considering only a month’s (or even quarter’s) worth of data is risky because the sample size is too small, while making a more sophisticated model to account for the small sample size is beyond our abilities. However we are comfortable looking at a full year of data, and now that the calendar has turned over to 2014 we can look back on the past year to see what happened. First, we noticed that real estate activity increased during the year. The number of closed transactions in 2013 was about 12% higher than in 2012. Deal count continues to be well below the consistent trend line that was established in the early 2000s, so there appears to be room for activity to increase even further. We also noticed that median prices have not shown nearly as much strength over the past two years as the activity levels. In 2013 the median single-family sales price rose less than 1% over 2012, and remains just below the median sales price for 2011. Pricing traditionally lags behind deal count in the real estate market. We saw this clearly at the top of the market, where prices continued to rise in 2006 and 2007 even though the deal count peaked in 2005 and was already falling quickly. The bottom of the market appears to be following this same trend, with prices more or less stable since 2009. 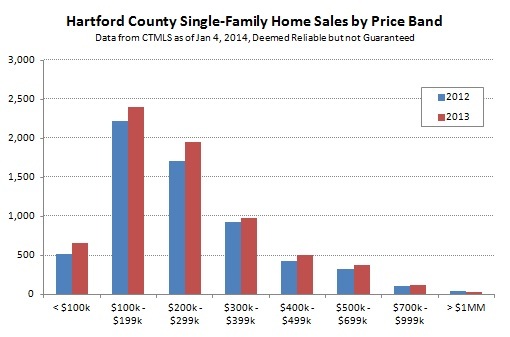 The Hartford County single-family home market has many individual town markets, and even neighborhood markets, that are all recovering at their own pace. We see some towns that are well into a recovery, with price appreciation. Other towns are struggling to find a bottom and buyers have an opportunity to really negotiate on price for their choice of homes. 2014 will continue this dispersion trend – the differences in the individual markets are likely to increase this year. The most difficult part of interpreting median price changes is understanding how the mix of homes sold at the various price points impacts the final result. 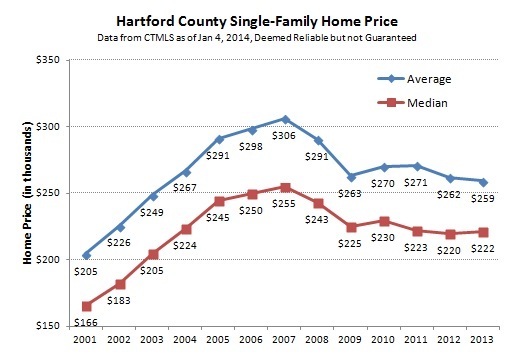 Hartford County has an active single-family market at a very wide range of prices, from less than $100,000, all the way into the millions of dollars. The number of closed deals increased in all of the categories except the $1MM+ bucket. We know that bank-owned homes continued to be listed and sold in 2013. However, it is difficult to know the exact number because not all agents mark them properly in the CTMLS. It appears that at least 787 of the closed single-family deals in 2013 were bank-owned, which represents about 11% of the overall market. There were an additional 332 deals that the listing agent described as a “potential short sale,” bringing the total distressed sale percentage up to nearly 16% of the overall market. Our view is that high-quality homes are attractive to buyers and seeing rising prices. At the same time, an active distressed market, with associated distressed prices, is putting downwards pressure on properties that are not in top condition. Buyers looking to update a home are more likely to go after the cheaper bank-owned property than a non-distressed house of the same quality. We expect the local real estate markets to continue to improve in 2014. We’ll postpone our detailed predictions for now, but the big-picture trends are positive in Hartford County. Please let us know if you have specific questions about your town/property – we’re happy to help. Next week we’ll provide specific, town-by-town data for Hartford County. 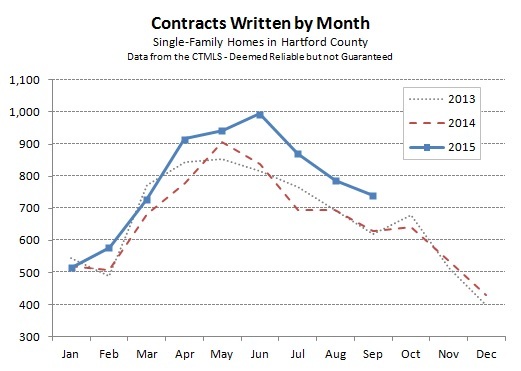 Hartford County real estate markets finished May with basically the same number of single-family deals as March and April. Looking at the chart below, one might think that the market has hit some sort of speed limit or something. Why haven’t we broken through the ceiling of about 750 deals per month? The only month on the chart with a higher total was April 2010, which was the deadline for collecting the Federal Home Buyer Tax Credit. We have no changes to report on the major themes from the spring. Mortgage rates are low, and buyers strongly prefer fully-updated move-in ready homes to fixers and other projects. Hopefully sellers are making a note of this and are taking a little time to at least clean their home up before it goes on the market. West Hartford was the big winner in May with 106 deals coming together, which was a 25% increase over the 85 from last May. The next closest town was East Hartford with 50 deals, so there was a huge difference between West Hartford and everyone else. Other towns on the chart below jump out because of how much more active May was this year compared to last year. Suffield increased from 7 deals to 23 for the single largest increase, but after looking at their trends in more detail it’s clear that the 7 deals in May 2011 was just abnormally low. 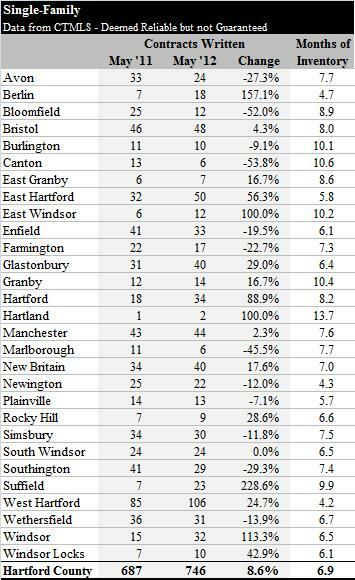 Year-to-date Suffield is only 37% ahead of last year, though that is still trending ahead of Hartford County overall, which finished May 24% ahead of 2011. Contrast that to Marlborough, Berlin and Granby, which are showing year-to-date increases of 85%, 76% and 74% respectively. Those three towns are smaller real estate markets, so it’s easier to see large swings, but the difference between last year and this year is striking. At the extreme end of this trend is Hartland, with 233% more deals than had come together by this time last year. Of course last year they were at 3 and this year the total is 10.